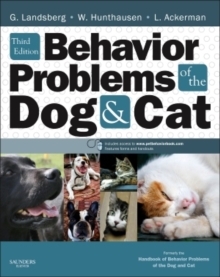 Formerly the Handbook of Behavior Problems of the Dog and Cat, the new edition of the definitive guide to the diagnosis and treatment of behavior problems of the dog and cat has been extensively updated. It retains the highly practical approach that has proved so successful in previous editions, offering diagnostic guidelines, preventative advice, treatment guidelines and charts, case examples, client forms and handouts, and product and resource suggestions along with details on the use of drugs and natural supplements to help optimize the behavior services offered in practice. To add to these features, the third edition is now fully referenced, there is significant new content, the book as been written with the entire hospital team in mind, and many color images have been added. The new edition welcomes a wide international mix of new contributors from Australia, Spain, Mexico and the United States. A website link gives access to the handouts and forms previously found on disk. 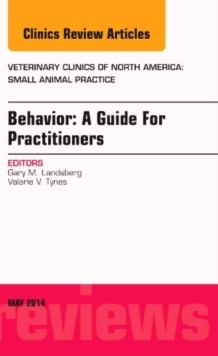 As well as fulfilling its original purpose as a practical tool for the busy clinician, this edition offers valuable and useful support material for all those studying the field of companion animal behavior. Now in full color and using a revised format, Behavior Problems of the Dog and Cat remains the most complete, up-to-date and practical resource for the treating and diagnosing canine and feline behavior problems. Many hot new topics covered including stress and its effects on health and behavior, and pain assessment and management. Three chapters are added, dealing with canine and feline communication, how to distinguish behavioral versus medical problems, and how to deal with fear and aggression in the clinic. Now thoroughly referenced to the scientific literature. Includes updates on drugs and natural therapeutics. Pain assessment charts now included. All-new color format offers extra illustrations throughout.